If you are looking to take control of your expensive printer fleet, we can help. Watch our video to see how, or call us on 01432 360229 to discuss your requirements. Print management benefits businesses by saving on printing costs. This is achieved by tracking employee usage by individual, office or department and providing comprehensive reports on usage costs, budgeting and environmental impacts. Call today on 01432 360229 to see how we can reduce print costs for you. Do cuments can be produced in superfast time, think of an electronic filing cabinet where you only need to type a reference point to find a document. All workflows can be captured from documents to emails and document management ensures legal compliance through its secure, rule-based document processing. You can centralise device recognition, load location maps, or be notified of any errors or low ink levels. About reports going to the wrong people, this system forwards files to individuals in a targeted way and can integrate up to 3,000 systems. 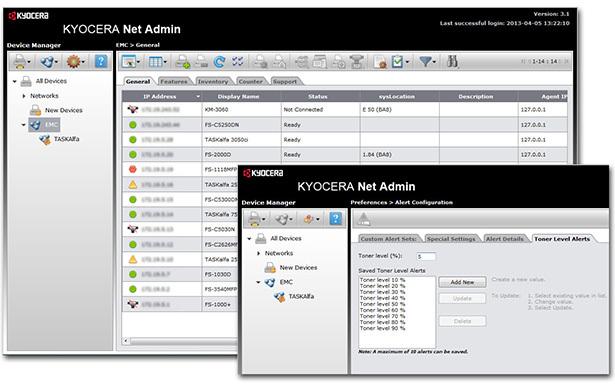 Can even be updated centrally for KYOCERA systems. We have various advanced features available on our equipment including tailored packages for variable data/forms, PDF direct printing and barcode printing. If you have a special requirement please ask us. Print photos and documents stored on mobile devices. File formats, include PDF, JPG, PNG, TXT, and HTML. Scan: Scan documents on an MFP and save them to a mobile device. *Authentication is possible via Job accounting or User Login. It is not possible to use both at same time. Businesses are unique and the HyPAS platform (Hybrid Platform for Advanced Solutions) from KYOCERA recognises this and provides multiple ‘off the shelf’ or customised applications to improve document workflow, enhance information sharing and optimise resource time.